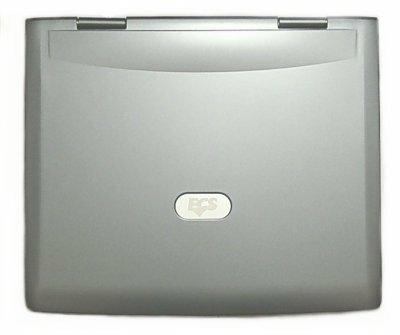 Some time ago we reviewed a portable computer which belongs to the new class of notebooks going without a battery - ECS Desknote i-Buddie 4 for the Intel Pentium 4 platform. However, the ECS's model row includes many other solutions including those based on the AMD's platform. On one hand, the AMD's products are not inferior in performance to their competitors and such system can be cheaper, but Athlons heat much and can cause overheating inside the notebook. We'll check it now and also compare this model with the Desknote i-Buddie 4. I recommend that you first read the previous review as it contains a lot of useful information on basic characteristics of the whole line and as I will be comparing the two models. There are not many differences, - the only one is that I got a promo version, i.e. with the preinstalled processor, memory and hard drive. By the way, this version doesn't mean expensive components - all of them are average, and the computer is not dear. The box is light beige with a red lid which looks more advantageous. Inside there is the desknote in foam plastic to fix the computer and a small box with accessories. Installation manual coming with a CD with Thizlinux 6. Network cable. The connector differs from a desktop one, but a cable from the Asus's notebook is a match. Telephone cable with an uncommon connector. S-Video extender. An S-video-RCA adapter is lacking, though it would be useful. Copper heatsink of an original design. ECS produces a number of accessories for the Desknote, for example, a floppy disc drive with the USB interface, two external batteries and automobile adapters. 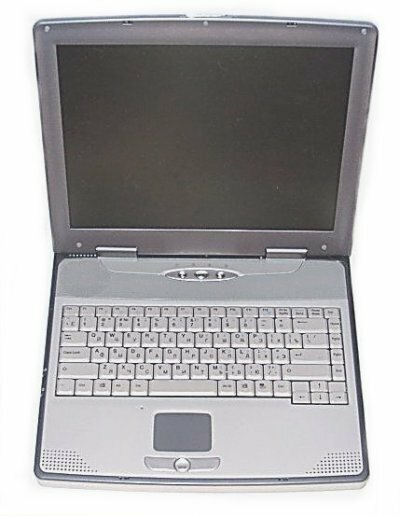 The tested model has Athlon 4 1 GHz. The tested model has 128 MB. The tests were carried out with the 256 MB module. The upper panel looks pretty nice. The bottom is the same as the previous model has. It's not a problem to replace the processor, hard drive and memory. 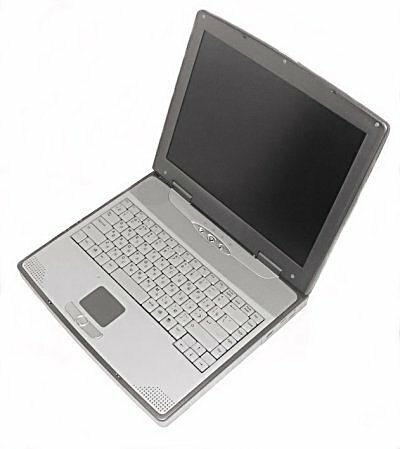 The hard drive is of the notebook type of the 2.5" form-factor. The processor is Athlon 4 but the connector is standard. The memory slot is usual "desktop" as well, for DDR SDRAM. There is only one memory slot, that is why you can't add more, only replace the old one. Now look at how the connectors are arranged. 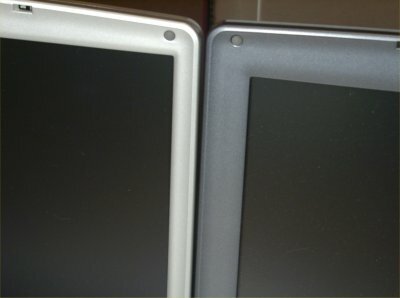 The back is similar to the i-Buddie 4, but on the side panels the connectors are arranged differently, and the new layout looks better. The modem jack is on one side with the network one, both cables now come to one side and it's more convenient to carry the Desknote from one place to another. The FireWire connector is moved closer to the USB, and now all ports for external devices are brought into one place. All strong and weak points of the body's design are the same, you can check them up in the first article. Testbed: Athlon 4 1 GHz, 256 MB 256 DDR SDRAM. On the other hand, the twice lower scores are not surprising because the Athlon 4 runs at a twice lower frequency (1 GHz). Besides, it has twice less memory - 256 MB against 512. Moreover, the test packet contains some applications optimized for the P4. In 3DMark2001 the AMD Athlon clocked at 1000 MHz and coupled with 256 MB RAM has surprisingly outscored the P4. With the graphics memory of 64 MB it managed to reach 1600 scores. I'm inclined to think that the video card works somehow faster, but at the same time it is so weak that the difference between 1 and 2 GHz is not noticeable. All advantages and weaknesses compared to desktops and notebooks remain the same, but I think that this model looks a bit inferior than the i-Buddie 4. First of all, look at the colors of the solution. 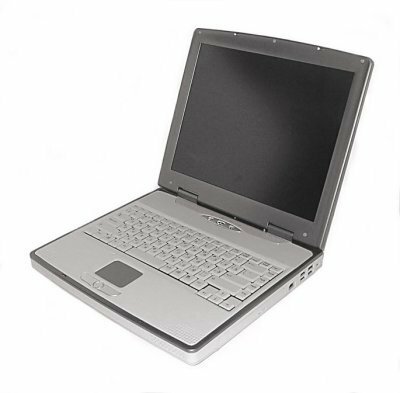 The i-Buddie XP that I had has a dark gray top panel like the rim around the keyboard. And the keyboard and other parts of the panel remain light beige and do not go with the darker edging. The silvery and gray colors look much better. As the screen is smaller (14.1 instead of 15) the borders are now wider, which doesn't add to attractiveness; besides, these 3 centimeters just make the computer bulkier. The matrix is similar in characteristics, and black color turns into negative very quickly. The screen is a bit smaller. I wouldn't say it affects comfort, but a 15" one of the same resolution would be better, especially for reading web pages with small fonts. Fortunately, the line has both models, and you can choose what you like. The video system is identical to the i-Buddie 4. Therefore, the characteristics, peculiarities of operation and dual-monitor support are identical. During the operation the configuration utility fell down (Windows Me). But when I reinstalled it, it worked flawlessly. By the way, it happened when I tried to interchange the main devices. Last time it happened in the same case as well. Probably, it's necessary to update this utility. 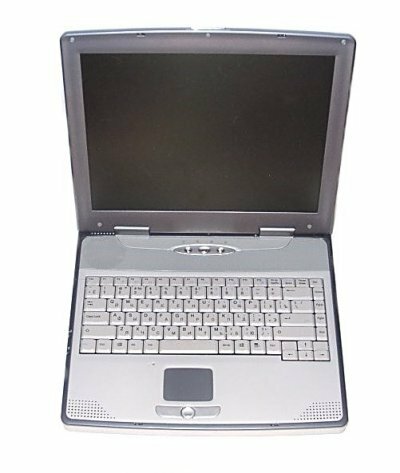 The tested model comes with a CD-ROM drive instead of a combo DVD-CDRW one. Such solution, however, looks wise. First of all, one saves $160-200. 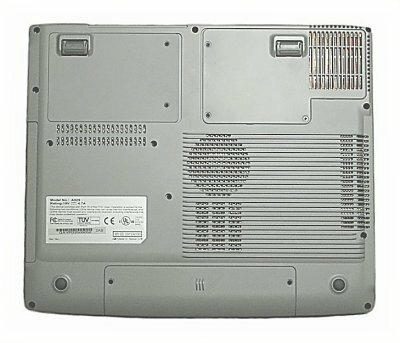 CDRW and especially DVD are a must in the all-in-one models, but it's a waste in a budget model. It's just a question of money - one can easily go with a notebook with a combo drive if he needs and can afford it. The sleep and hibernation modes worked perfectly in the Windows XP as well as in Windows Me! The noise and heating are a bit worse compared to the P4. The system heats similarly to the previous one - when on a hard desktop, it is only the upper panel that heats up more or less. But if you block the underneath air vents, the lower part will heat up very quickly and make the keyboard warm as well. I couldn't overheat the computer. The CPU cooling system works at its breaking point - the bottom vent and the CPU's plastic cover get warmer, contrary to the P4. Surprisingly, the monitoring shows that both systems have the same temperatures - 35-52 degrees, but the bottom of the processor in the Desknote XP is the hottest place while it is almost the coldest one in the P4. Obviously, the XP uses an external sensor, but why such a big difference! If the monitoring is incorrect, then the cooler management is poor. By the way, the fan works at a higher rate and produces more noise. Although the buzzing is not that unpleasant and loud, a high noise level is always a disadvantage, especially in comparison with the almost noiseless P4. Can we reduce it? First I hoped that the computer might have supported the rotation speed control system depending on the CPU's temperature, but I couldn't find it. Just for comparison I put both notebooks on the table, started a movie in the MPEG-4 (DivX) and the Motherboard Monitor (only the latest beta version could detect the temperature correctly. The fan revolutions monitoring failed to start). While the movie was played, the temperature went up from 35 to 54 degrees C (both systems showed close temperatures different by just 1-2 degrees in favor of the XP). I didn't hear that the fans changed the speeds, probably the algorithm of the speed control didn't work. By the way, at the start of the system the fans go to their maximum and make almost the same noise. The speed falls down after the Windows finishes booting. The previous model was a good buy for a home even as a main computer. Noiselessness, attractive appearance, rich accessory pack and low price. The current model, however, suits an office better. When buying a number of computers for an office a cheaper model is always preferable, and the configuration offered is a perfect match. By the way, the promo version (i.e. with the hard drive, memory and processor) has a price now fixed at $850, which is not much even for a desktop computer coupled with an LCD panel. However, such model can also be used at home - budget-concious users will appreciate such system: at such sum of money it's not easy to find even a desktop computer with the same features, not to mention a portable one. 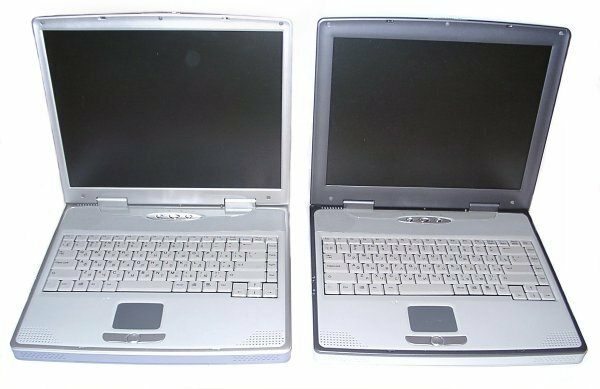 As to an optical drive, you should choose it depending on what you really need, but as to the matrix, I'd recommend the 15" one - it looks better and is handier. The system with the excellent price/quality ratio will be a good choice for those users who need an inexpensive and fully stuffed working system. The P4 based model has a higher price (such processors are always more expensive, and it's for you to decide whether you really need such), but it has better noise and speed parameters. Well, it is for you to choose.